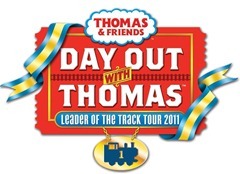 We'll be meeting up with him in Blowing Rock, North Carolina, but you can see his entire schedule and the rest of the tour details at the Day Out With Thomas Tour page! If you haven't heard of Day Out With Thomas, and you have a Thomas fan in your house, this is his 16th year touring North America and he'll be visiting 45 different venues, so I'm sure there is one that won't be too far from home! 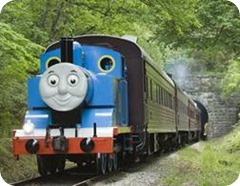 Day Out With Thomas is the only place for families to take a ride with a 15-ton replica of everybody’s favorite No. 1 engine, Thomas the Tank Engine, and enjoy Thomas-themed activities at the Imagination Station, including stamps, temporary tattoos and hands-on arts and crafts. Each year the tour grows, traveling to new destinations, adding new activities and welcoming new visitors. If you're not to far from Blowing Rock, I'd love to meet up with you and your family while we hang with Thomas and check out the Tweetsie Railroad, who are hosting Thomas that week! You can get your tickets online at WWW.TICKETWEB.COM/DOWT for this and all of the other events! Disclaimer: My family and I will be Thomas' (through his PR rep) guest in exchange for posting, tweeting and sharing our Day Out with Thomas experience. All opinions are my own.